Torino will look to end a run of three matches without a victory as they travel to Rome to face Lazio on Wednesday night. The Granata will once again be without Angelo Ogbonna who is not yet ready to play 90 minutes, whilst experienced midfielder Giuseppe Vives will also miss out. However, Mario Santana has recovered from his injury and will return to the squad, whilst fellow winger Valter Birsa could start after making a brief substitute appearance against Parma. Lazio have made a bright start to the season and are currently in 4th place, despite losing 2-0 at Fiorentina on Sunday. Coach Vladimir Petkovic will be forced into making a number of changes from that match, as both Cristian Ledesma and Hernanes are injured, whilst Ederson and former Torino primavera goalkeeper Federico Marchetti are both injured. 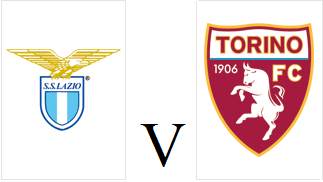 Whilst Torino are desperate for three points, their record against Lazio is not a particular good one - with just four victories in the last twenty years. Toro's last victory against the Biancocelesti was in January 2002, with Cristiano Lucarelli scoring the only goal. Torino's poor home form continued as they were defeated 3-1 by Parma on Sunday afternoon, although they were forced to play most of the second half with ten men after Gianluca Sansone's controversial red card. Matteo Darmian and Kamil Glik returned to the Toro defence, although Giampiero Ventura surprised many by leaving both Rolando Bianchi and Alessio Cerci on the bench. Gianluca Sansone was given a rare start, whilst Riccardo Meggiorini was given the central striker role. And those changes looked as though they may finally solve Torino's home goalscoring problems in the early stages, as the Granata created three great chances in the opening ten minutes. Firstly a great through ball by Alen Stevanovic put full back Matteo Darmian through on goal, but his left footed shot hit the side netting. Two minutes later, an ambitious volley from Riccardo Meggiorini almost caught out Parma's second choice keeper Nicola Pavarini, but the veteran reacted well to deny the former Bari striker. Torino should have taken the lead via Gianluca Sansone, but he somehow headed Stevanovic's cross over the bar. After surviving the initial Granata onslaught, Parma came back into the game and former Juventus striker Amauri somehow blazed over the bar after excellent play by Jonathan Biabiany. Toro began the second half in similar fashion to which they started the first, and once again Gianluca Sansone came close to opening his account for the club, but he was denied by Pavarini. However, the match turned on the 53rd minute when Torino were reduced to ten men after the lively Sansone received a second yellow card for simulation. Whilst Gabriel Paletta's challenge on the former Sassuolo striker was probably not worthy of a penalty, there was certainly contact between the two players.Therefore the decision to send Sansone off (who didn't even appeal for a spot kick) was an extremely harsh decision by referee Piero Giacomelli. 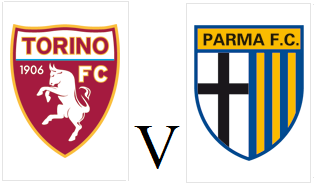 Torino's ten men held out for twenty minutes, but Parma finally got the breakthrough after substitute Nicola Sansone (no relation) fired a fierce left footed shot past Jean-Francois Gillet. And with Toro still recovering from that goal, Parma doubled their lead one minute later when Amauri headed home an inch-perfect cross from Marco Marchionni. The away side still had time to score a third goal as some hesitant defending from the normally reliable Matteo Darmian allowed Biabiany to cross for Aleandro Rosi to tap home from close range. With the last kick of the game, Torino did get a consolation goal as substitutes Alessio Cerci and Migen Basha combined to allow the latter to volley home from six yards - Toro's first goal at the Stadio Olimpico for 388 minutes. This result was certainly a disappointment as Torino's poor home form continues, but the match was undoubtedly changed by the referee's controversial decision to dismiss Gianluca Sansone with the score at 0-0. With two difficult away games on the horizon (against Lazio and Napoli) the Granata could find themselves in the relegation zone this time next week, almost unthinkable after their bright start. Having gone over 300 minutes without scoring a goal in front of their own fans, Torino will be hoping to break that rather unwanted record against Parma on Sunday afternoon. Angelo Ogbonna will once again miss this game through injury, so Guillermo Rodriguez and Valerio Di Cesare - the partnership that kept a clean sheet against Palermo could keep their places. Matteo Darmian is back from suspension, so he should come in at right back, and that could see Danilo D'Ambrosio move over to left back. With Torino struggling to score goals, coach Giampiero Ventura may finally turn to Gianluca Sansone who has rarely been given an opportunity since signing from Sassuolo in the summer. Opponents Parma have been unable to replicate their fantastic home form on the road this season, and have only picked up one point from their four away games. Former Juventus striker Amauri scored twice in their last game to see off Sampdoria, but their goalkeeper Antonio Mirante received his fourth booking of the season in that match, so he misses out through suspension. The last time these two sides met in 2008 was an entertaining encounter, as Toro fought back from 4-1 down to draw 4-4, with Roberto Stellone scoring twice. Although a repeat of that scoreline tomorrow would be extremely unlikely, it would certainly rectify Torino's goalscoring problems. Torino continued their unbeaten run away from the Stadio Olimpico, as they recorded their third goalless draw of the season at Palermo on Sunday afternoon. The Granata lined up with an unfamiliar back four, as Matteo Darmian was suspended, Angelo Ogbonna was injured, and Kamil Glik was rested having been on international duty in mid week. That meant Uruguayan centre back Guillermo Rodríguez came in to make his debut, whilst Giuseppe Vives was brought in to reinforce the midfield. The home side dominated the early exchanges, and Jean-Francois Gillet made two good saves to deny Slovenian midfielder Jasmin Kurtic from distance. Palermo continued to attempt long range shots, firstly from Edgar Barreto, and then from Josip Illicic's free kick, but once again the Belgian keeper produced two magnificent saves to stop the Rosanero taking the lead. Just before half time, Torino almost took the lead themselves as good work from Riccardo Meggiorini and Alessandro Gazzi put Rolando Bianchi through on goal, but the Torino captain was denied by Samir Ujkani. At the other end, Palermo continued to create chances, and after Illicic's excellent through ball, Swiss full back Michel Morganella was one on one with Gillet, but once again the Belgian came out on top. Torino were more positive in the second half, and had a great chance to open the scoring, but unfortunately Riccardo Meggiorini rushed his shot, and provided Ujkani with a simple save. With just three minutes of normal time remaining, Josip Illicic had an excellent opportunity to gain all three points for his team, but his shot was wildly off target. In the end, a draw was probably a fair result, as a combination of poor finishing and outstanding goalkeeping meant that the game stayed goalless. However, Torino's lack of goals continues to be a worry, as they have only scored nine goals all season, five of which were in the same game against Atalanta. 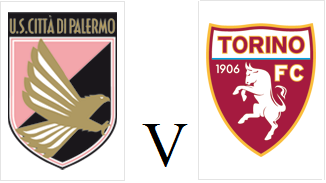 Torino return to league action on Sunday after an enforced two week break due to the international fixtures, and will make the long journey south to take on Palermo. Argentinean winger Mario Santana was injured in the defeat against Cagliari, however fellow winger Valter Birsa has recovered from his injury and is available to make his debut. Defender Kamil Glik had a very eventful international break, as he scored Poland's equaliser against England - and after conceding two penalties in recent weeks, that goal will hopefully give him a much-needed confidence boost. Palermo's notoriously impatient president Maurizio Zamparini has already made one managerial change this season as Giuseppe Sannino was sacked in favour of the more experienced Gian Piero Gasperini. That change in coach has made an immediate impact in terms of results, as the Rosanero have gained four points from his two games in charge, including an impressive 4-1 win against Chievo. Striker Abel Hernández was injured on international duty with Uruguay and is out long term, however captain Fabrizio Miccoli is back in favour and should start upfront. Despite being 33, Miccoli scored a hat-trick in the aforementioned victory over Chievo, thus showing that his immense talent is still there. André Luciano da Silva - more commonly known by the nickname Pinga, arrived from the unfortunately named Brazilian club Juventus SP in 1999. The skillful attacking midfielder made only seven appearances in his debut season, but showed his quality by scoring a brace against AC Milan in April 2000. However, he was unable to prevent Torino being relegated to Serie B at the end of that campaign. The Granata bounced back to Serie A at the first attempt the following season, and Pinga contributed by scoring twice in twenty-two games. 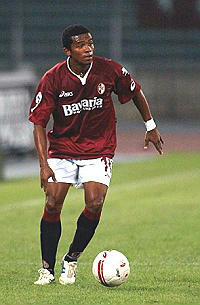 In the 2001-02 season, Torino achieved an impressive 11th place finish, but the Brazilian only made five appearances and was therefore loaned to Siena for two seasons in order to play regularly. After helping Siena gain promotion to Serie A, Pinga returned to recently relegated Torino ahead of the 2003-04 season with the aim of helping the team make an immediate return to the top flight. It was during this season that the playmaker began to wear a Granata coloured bandana during matches, and he also seemed to have put on a few more pounds in his stint away from the club. However, despite the larger waistline, he managed to enjoy his most successful season in a Torino shirt by scoring six times in an otherwise unforgettable season as Toro finished in mid-table. The following season, with the bandana now discarded (apparently for being unlucky), Pinga improved on his goal tally once again by scoring nine times (including a goal in the Playoff semi-final against Ascoli) to help Toro finally gain promotion to the top flight. However, as we know, Torino were denied promotion to Serie A due to their financial problems, and after all their contracted players were released following bankruptcy, Pinga moved on to Treviso. A move back to Brazil with Internacional followed, and despite only being 31, he has spent the last four seasons in the United Arab Emirates, and currently plies his trade with Al Dhafra. Torino succumbed to their second defeat of the season as they were beaten 1-0 by bottom of the table Cagliari on Sunday afternoon. The home side made just the one change from the team that thrashed Atalanta in their last outing, as Alen Stevanovic replaced Mario Santana in midfield. 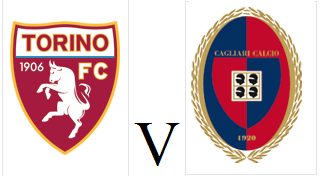 Captain Rolando Bianchi had Torino's first half chance of the match, as he attempted an ambitious header from Matteo Darmian's cross, but Cagliari keeper Michael Agazzi stopped it with ease. At the other end, Cagliari, who were keen to impress new management team Ivo Pulga and Diego Lopez, came close to opening the scoring, but Toro were thankful that Jean Francois Gillet was able to tip Fernando Avelar's shot over the bar. The second half began with Cagliari continuing to look threatening and Radja Nainggolan cleverly evaded Angelo Ogbonna, before drilling his shot wide of Gillet's goal. And with fifteen minutes remaining, the away side were given the opportunity to take the lead after Kamil Glik was harshly adjudged to have handled Davide Astori's volley inside the area, and striker Nenê smashed home the resulting penalty. The Isolani then came close to doubling their lead, as Victor Ibarbo was put through on goal - but the Colombian striker was denied by the post. That chance seemed to give Torino the wake up call they needed, and when Rolando Bianchi headed home a Giuseppe Vives free kick, it seemed as though the home side had rescued a point - but the goal was disallowed because of a marginal offside. In the closing stages, substitute Gianluca Sansone delivered a teasing cross that found captain Rolando Bianchi once again, but his improvised shot at goal went just wide of the post, and Cagliari held on for their first win of the season. Whilst this was undoubtedly a disappointing result, no Granata fan can be that surprised that they followed up an impressive 5-1 away victory with a home defeat against a team who were bottom of the league - because that's just what Toro do. After last Sunday's incredible 5-1 win at Atalanta, Torino face bottom of the table Cagliari in search of a second consecutive victory. Former Cagliari player Alessandro Agostini has been included in the squad for the first time, although Danilo D'Ambrosio is expected to keep his place at left back. After coming off the bench to score against Atalanta, Alen Stevanovic could replace Mario Santana in midfield, but that may be the only change from the team that won so impressively last weekend. Cagliari have had a difficult start to the season and are bottom of the table with just two points from their six matches. Former Torino midfielder Massimo Ficcadenti was sacked as coach after the defeat by Pescara, and has been replaced by the inexperienced duo Ivo Pulga and Diego Lopez. Torino won their first away game of the season with a sensational 5-1 victory at Atalanta on Sunday afternoon. After starting on the bench in midweek against Udinese, Rolando Bianchi came back into the starting eleven, as did winger Alessio Cerci who was also rested for that match. The home side attacked from the outset, and it was very evident that this match would be an entertaining affair - a stark contrast to Torino's last two away games. Atalanta came close to taking the lead when Luca Cigarini's free kick hit the crossbar, but just before the half hour mark they did open the scoring when Torino failed to clear a corner and when the ball was played back into the area, German Denis narrowly beat the offside trap to slide the ball past Jean-Francois Gillet. That goal forced Torino to attack, and their equaliser was quite literally "handed" to them ten minutes later. The away side were awarded a penalty when Danilo D'Ambrosio's cross hit the arm of Giacomo Bonaventura, and captain Rolando Bianchi sent goalkeeper Andrea Consigli the wrong way with his spot kick to level things up. On the stroke of half time, German Denis was fouled on the edge of the area, as once again the Toro defence struggled to cope with the powerful Argentinean striker. Denis picked himself up to take the resulting free kick, but once again the ball cannoned off the crossbar - perhaps early proof that Torino's luck was beginning to change, as the Granata had hit the woodwork on three occasions themselves in their previous match. At the beginning of the second half, Toro had to rely on Jean Francois Gillet to keep the scores level, as the Belgian keeper first denied Federico Peluso, and then Bonaventura in quick succession. And those saves became even more important, as moments later the Granata took the lead, when Alessio Cerci's corner was headed in by an outstanding diving header from Alessandro Gazzi. Just four minutes later Torino had a third goal and effectively ended the match as a contest, when Alessio Cerci delivered a perfect cross to find substitute Alen Stevanovic who scored with an exquisite left footed volley. The away side were still not satisfied, and scored a fourth goal when another Cerci corner found an unmarked Torino player - this time Danilo D'Ambrosio, who scored yet another headed goal to further his claim as the best full back in the world (maybe I'm exaggerating) at scoring with his head. Three minutes later Toro added a fifth goal, as Rolando Bianchi met Alen Stevanovic's through ball before blasting the ball past Andrea Consigli, who like many, must have been wondering what had happened to his defence. That goal was Bianchi's 70th in a Torino shirt, and he now enters the record books as Torino's tenth top scorer of all-time (tied with Ezio Loik) - an incredible achievement in the modern era. The remaining fifteen minutes of the match was played at a slow tempo, with Torino more than happy with their margin of victory, and a shell-shocked Atalanta side still trying to comprehend what had happened. This was the first time Toro had scored five goals in a Serie A away game since May 1993, and was enough to move the Granata up to sixth place in the table.